Trooper, a line of beers produced by Robinsons Brewery under the supervision of heavy metal legends Iron Maiden, has announced the impending release of Sun and Steel. 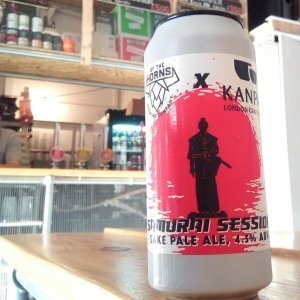 Named after a song on their 1983 album Piece of Mind, it’s a unique beer that uses sake yeast in the brewing process. Say hello to Iron Maiden Beer SUN AND STEEL! Coming in May 2019! Sun and Steel took over two and a half years to develop and was made with the help of 300-year-old Okunomatsu Brewery in Fukushima. Heavy metal fanatic, friend of Iron Maiden, and owner of Okunomatsu, George (Johji) Yusa provided samples of sake yeast to the team at Robinsons to help create Trooper’s first lager. Bottles of Sun and Steel are adorned with the Iron Maiden mascot, Eddie, dressed in samurai armor. It’ll be sold in the UK on Trooper’s sixth anniversary, May 6. Plans for a world tour are set for the end of this year. Every year the breweries of Niigata Prefecture come together and hold the Niigata Sakenojin festival for two days. It’s an event modeled after Germany’s Oktoberfest and is quickly growing to a comparable size with over 140,000 attendees in 2018. 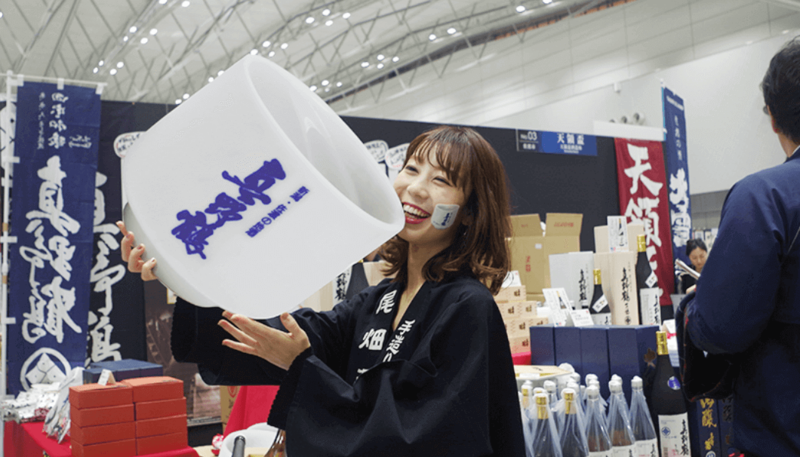 SAKETIMES went this year and battled the crowds to see and sample some of the over 500 brands from 80 Niigata-based breweries. Luckily, the weather was mild, because in order to get some of the more coveted brands like Masukagami Brewery‘s F40 and Shizuku, would-be drinkers will need to line up ahead of time. The venue was divided into sections representing the four regions of Niigata Prefecture: Sado, Joetsu, Chuetsu, and Kaetsu. The purpose is to easily find your favorite brands and to show how the geography of Niigata can affect the taste of the sake produced there. For example, Niigata has a reputation of producing dry sake but producers in the Kaetsu area like Ichishima Brewery and their Omon brand, have a very fruity taste with a low alcohol content. It wasn’t just sake that drew in the huge crowds on the first day of Niigata Sakenojin; there’s also a plethora of local cuisine available. 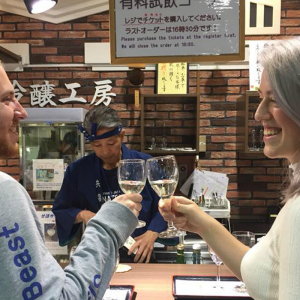 The oyster booth was a highlight..
Niigata Sakenojin is arguably Japan’s largest sake event and appears to be steadily growing. 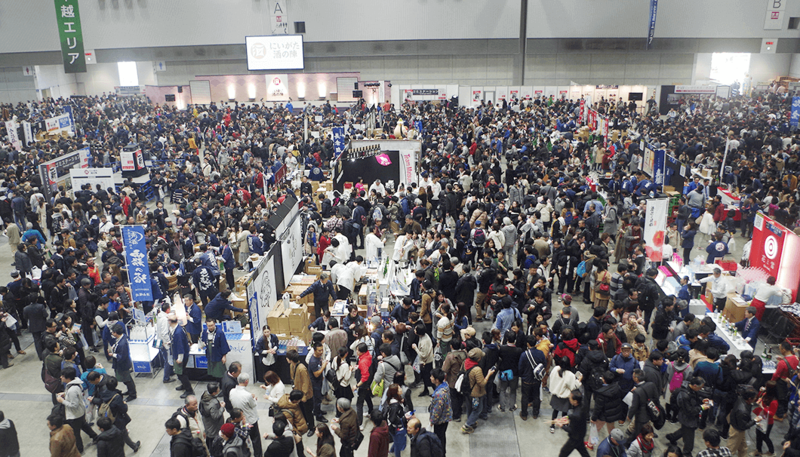 Organizers have promised that next year there will be improved measures to handle the crowds and ensure visitors can easily get to the sake they want to try the most. So, while this year’s festivities have come to a close, attendees can expect an even better experience in Niigata Prefecture the same time next year. Major airline JAL has announced their selection of sake, wine, and champagne to be offered on first class and business class international flights. In keeping with the luxuriousness of the seats, the finest beverages in each category were selected by expert advisors. 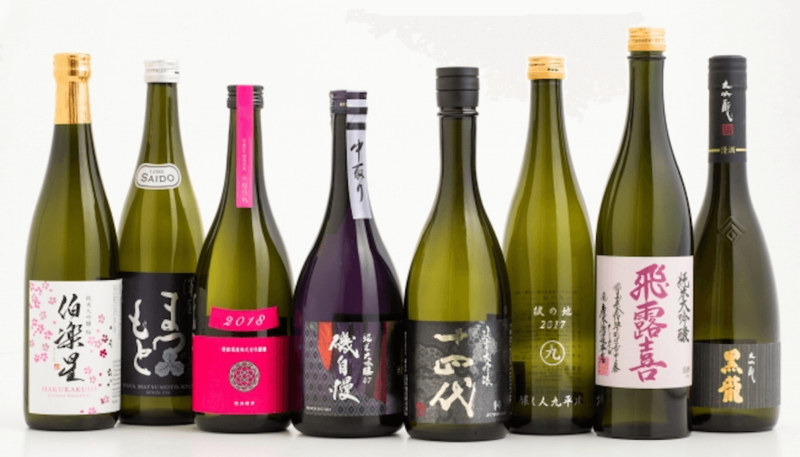 The sake will change every three months and include upscale brands like Nakadori Junmai Daiginjo Amethyst from Isojiman Brewery in Shizuoka, and Yamagata Prefecture’s Juyondai Junmai Daiginjo in first class. Business class passengers will be treated to such brands as Kamonishiki Junmai Daiginjo from Niigata Prefecture and Sake Competition 2018 winner Megumi No Tomo by Shimizu Seizaburo Shoten of Zaku, in Mie Prefecture. 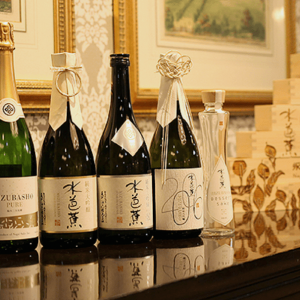 In addition to sake, a number of respected wines and champagnes are also in store for first class customers. The Chateau Lagrange label, previously on the brink of extinction in recent years but resurrected with the help of the University of Bordeaux and Japanese beverage maker Suntory, will also make an appearance. It features a smooth and balanced sweetness with hints of bitterness. It’s a tempting array of fine drinking that ought to sway some into splurging on the luxury of a first class seat for their next JAL flight.